Hello! My name is Cassidy and I found a rock! It just so happened to appear to me at the right time. Lately, I've been feeling down due to school and family issues/problems. 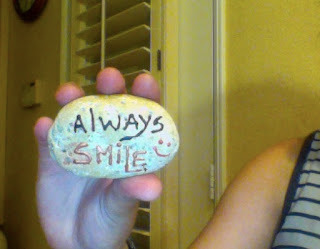 But today, I went on my daily run, and I found this rock in Sorrento Valley on a bench when I was taking a five minute break! I saw it and couldn't help but smiling. Thank you so much for starting this great idea! It really made my day, and I will be taking this rock with me to my trip to New York City. So, hopefully you're inspiring rocks will make it around the world!